The team here at Bert Ogden Edinburg Mazda isn't just interested in making a sale. We want our customers to trust us to help them make the informed decision possible in their car-buying process. That's why here on our website, we make it a point to provide drivers with model research, and pages exploring how Mazda models compete with other models in their class. 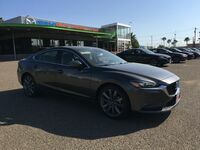 Today, we'll be taking a look at a comparison between the 2018 Mazda6 vs the 2018 Audi A7. Audi is a well-known luxury car brand, but you'd be surprised at the premium features and trims the 2018 Mazda6 has on offer in its Signature (top) trim level. For purposes of this comparison, we'll be specifically comparing the 2018 Mazda6 Signature with the 2018 Audi A7 Sedan. The Mazda6's highest trim level has a starting MSRP of $34,750*, compared to the Audi A7's base MSRP of $60,700. We know the difference in price points are stark, but let's see how they compare otherwise. When you look at the chart above, it's hard to dispute who the winner is. In plain black and white you can see that the 2018 Mazda6 Signature simply offers drivers far more for far less. Standard Ventilated front seats with Napp leather trim are just an example of some of the ultra-premium features that the 2018 Mazda6 makes available to drivers at a much better price point than the 2018 Audi A7. This is largely thanks to Mazda's long-time commitment to innovation, design advancement, and a truly refined driving experience.